“If papa would not have wrapped me up and protected me I wouldn’t be here,” the teen told his mother. A grandfather died saving his 13-year-old grandson when he used his body to cushion the blow as they plummeted 150 feet down a mountain in a soft-top Jeep. Kerley's father, Jerry Greenough, had taken his Jeep up and down the Red River, New Mexico, trail more than 40 times, she said. He made the trip yearly with Kerley’s husband, Tony, to off-road on the steep trails and camp in the Colorado mountains. This was the first year Kerley allowed her 13-year-old twin boys, Austyn and Tyler, to join the annual “guys trip,” she said. On Sept. 2, the second day of the trip, Tony and his father-in-law drove on the familiar trail, Tony and Tyler leading the way in one Jeep, and Jerry and Austin following behind in the other. When a tire of the second Jeep got caught on a rock, Austyn radioed his father for help. But before he got a response, the Jeep slipped off the trail. 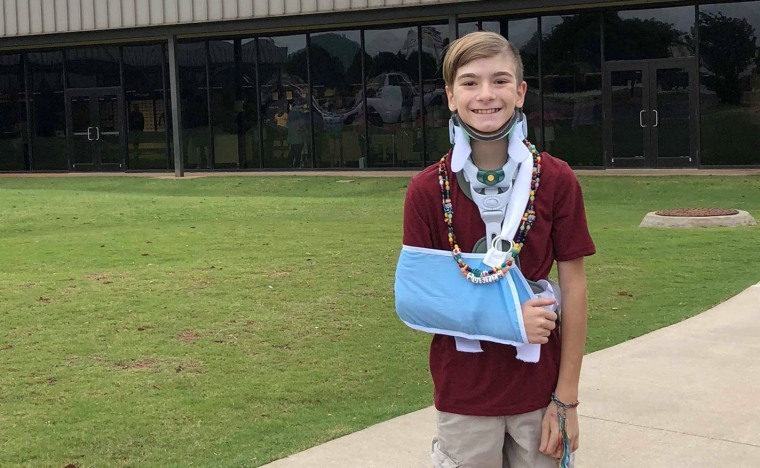 With Austyn and his grandfather inside, the Jeep plunged 150 feet down the mountain, losing its soft-top at some point along the way, and ejecting them both before coming to a stop. Kerley said her son remembers the fall. Austyn told his mother that his grandfather repeatedly said he loved him and that he would be safe during the fall. “He was so calm and peaceful the whole way down so that my son would not be scared,” Kerley relayed through tears. She believes her father’s embrace saved her son’s life and kept him from suffering lasting brain damage. Greenough, 63, died on the mountain. “He took all the blows as they rolled,” Kerley said. The Taos County Sheriff's Department said in a statement the Jeep "overturned several times before landing about 150 feet down a steep embankment." The Jeep was navigating "a narrow and steep forest road," and both Greenough and Austyn were throw from the vehicle, according to the sheriff's office. It didn't appear the either grandfather or grandson were wearing seatbelts. Austyn was airlifted to University New Mexico Hospital in Albuquerque. By the time he arrived, he had lost 40 percent of his blood and had suffered from respiratory failure twice, Kerley said. Doctors also treated him for internal bleeding, a collapsed lung, broken ribs, spinal fractures, a lacerated pancreas and liver, a broken clavicle and a ruptured spleen. Austyn also wanted NBC News to know that he broke his pinky. “Nothing prepares a mother to walk into an intensive care unit to your son in that condition,” said Kerley, who flew from their home in Oklahoma to Albuquerque as quickly as she could after her husband called her about the accident. “He was intubated and sedated, covered in blood — head-to-toe blood,” she said. Doctors told the family Austyn would be in the New Mexico hospital through at least October, and would then have to get treatment at an in-patient hospital in Oklahoma for several months after that. Austyn went home last week. Kerley said he has the same upbeat attitude that he did before the accident and throughout his entire hospital stay. “He’s a blessing,” she said. But she’s missing her dad, who she said was at every one of her three kids' activities — every recital, every competition, even games in 20-degree weather. That’s why she’s not surprised he shielded her son from danger.